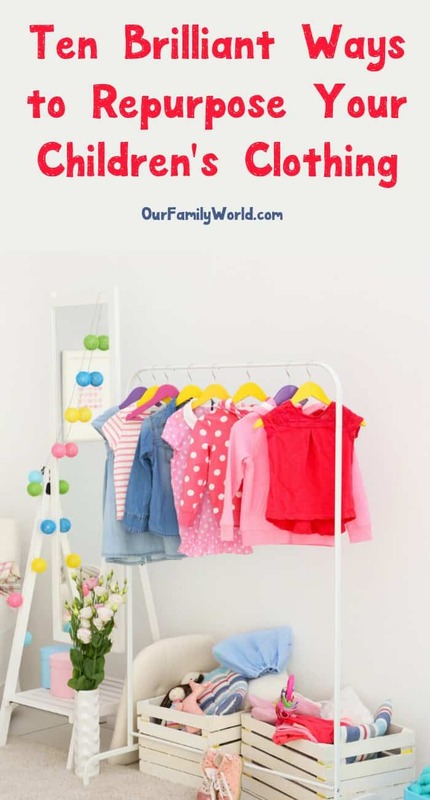 If you have a basket full of children’s clothing that is too small, too worn, or even outdated, take a peek at these ten ways to repurpose children’s clothing. You might just be surprised at how many fun and frugal options you have to give that clothing new life! Children tend to grow at such a rate that they are needing new clothes every 4-6 months. It is amazing what little blossoms they can into, growing at a rate that is challenging for any wardrobe! Because children outgrow their clothing so quickly, you might find yourself overwhelmed with children’s clothing you can no longer use. Of course there are a couple of choices you may already be aware of, such as donating them to the less fortunate, selling them at a consignment shop, or passing them on to a family member. But did you know there are even more ways to repurpose children’s clothing? You don’t have to be limited to those three options when it comes to outgrown children’s clothing. In fact, with a little creativity the sky is the limit when it comes to those old children’s clothing items! 1. Make instant doll clothes. Many dolls, including popular 18 inch dolls can wear children’s clothing. Doll clothing can be very expensive, so instead, save your old children’s clothing and work some magic on it to make it fit. T-shirts can be made into super hero capes, pant legs can be cut into skirts, socks can be made into leggings, and colorful clothing pieces cut into triangles make great head bandanas! You don’t even need to sew stitch, just snip your fabric and use fabric tape or glue! Now don’t panic, you don’t have to be a professional seamstress in order to make a patchwork quilt. In fact, the imperfections of a patchwork quilt is what gives them so much charm. Preserve family members by taking some of your child’s clothing items and cutting them into 10 inch squares. Then simply stitch the edges together on a sewing machine using a basic stitch. Attach to a solid backing and you are finished! To go with your patchwork quilt, you can make a few little pillows! Find a few colorful clothing items and cut into 10 or 12 inch squares. Place two squares on top of each other and stitch the corners together. Leave a few inches so you can stuff with batting or even more fabric scraps. Close your pillow up and you are done! Kids will love seeing their clothing turned into a fun and cozy pillow. Soft books are a great gift for babies and toddlers. They will love turning the soft pages and feeling the textures. Try making a fabric book out of various baby clothes, with each page a different color and/or texture. All you need to do is cut clothing into 10 inch squares, line up on top of each other, and sew the right side with a simple stitch from top to bottom. That’s it! You now have soft pages their little hands will love to flip through. 5. Make a small motor skills book. If you have toddler age children learning fine motor skills, creating a book especially for them is ideal! This book is just like the soft book for babies, but can incorporate other parts of clothing such as a page with a zipper, a page with buttons, a page with overall clasps, and on. This is a great way for children to learn how to use these different systems. Simply use pieces of clothing that have these objects on them, and make sure the child is old enough for there to not be a choking hazard any longer. 6. Make a cat toy. Not exactly for children, but still a great treat for your fur baby, an easy stitch cat toy is simple to make with clothing scraps. A low-tech rattle is very easy to sew up, simply by sewing fabric into a ball, stuffing it with cotton batting, and adding a little catnip or crunchy paper inside. Cats will enjoy chasing this little gem around, hearing the noise, and smelling the catnip! 7. Make fabric covered buttons. Fabric covered buttons are fun to make, so whimsical, and allow you to add a little piece of your family history to any piece of clothing. Take some colorful scraps and wrap them tightly around fabric buttons. Secure with a small stitch or fabric glue. These colorful fabric buttons can then also be used on home decor items, pillows, and more. Rosettes look like little fabric flowers, and are so easy to make. These can be added to your clothing, headbands, purses, or used in decorations around the house. Just cut your clothing into long strips, twist, and start to wrap in a coil shape. Secure with a small stitch or fabric glue and you are done. You can literally stick these to anything for extra and inexpensive charm! Some clothing pieces may be too precious to cut up. Perhaps you still have the outfit you brought your child home from the hospital in. Don’t be afraid to frame the clothing just exactly as it is. Look for frames with a 1/2 inch or so depth to them and simply press your outfit between the glass and backing. It will look so cute displayed on the wall. 10. Make doll or pet bedding. Cut your clothing into thick strips and weave into a fabric mat. Secure the ends by tying as you would a no sew blanket. These little fabric mats make excellent doll or small pet beds! They are soft, colorful, and won’t cost you a dime! As you can see, you have another ten great options when it comes to ways to repurpose children’s clothing. You don’t need to toss it or let it take up space any longer. Instead, give one of these uses a try and see how easy it is to give your clothing new life! If you loved this post on ways to repurpose children’s clothing, check out Katie’s other amazing posts on repurposing your kids’ items, including: Ways to Reuse Wipes Containers, Repurposing Stuffed Animals and Ways to Reuse Children’s Books. Do you have any great ideas on ways to repurpose children’s clothes? We’d love to hear about them! Great ideas! We always pack up our clothes for the Diabetes Association pick-up. But, there are some clothes that just aren’t good enough to give away, so I love the idea of doll bedding! What fun ideas. I’d like to try to make a quilt because it will have fun memories in it if I think of my son at the different stages based on squares from old clothing. What AWESOME Ideas Who Would Of Thought Of It Thank You!